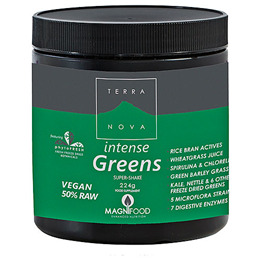 TERRANOVA Magnifood Intense Greens is a deeply nourishing, intensely synergistic blend of Rice Bran Actives, Cereal Grasses,Microalgae, Fresh Freeze Dried Greens, Probiotics and Digestive Enzymes - plus the equivalent of a 28ml wheatgrass juice shot in every serving. Cereal Grasses - Providing chlorophyll, vitamins, minerals, antioxidants and enzymes. Each serving provides the equivalent of a 28ml wheatgrass juice shot. Microalgae - Providing chlorophyll, phycocyanin, carotenoids, highly digestible protein, enzymes, vitamins and minerals. Fresh Freeze Dried Greens - Providing sulphoraphane, indole-3-carbinol, glucosinolates, carotenoids, chlorophyll, live enzymes, vitamins, minerals and more. * Potency at the time of manufacture. Keep out of reach of children and store in a cool dry place. Food supplements should not be used as a substitute for a varied diet. Not recommended during pregnancy or breastfeeding unless on the advice of a healthcare practitioner. If taking prescribed medication, consult a physician before using this product. Below are reviews of TERRANOVA Magnifood Intense Green Super-Shake - 224g by bodykind customers. If you have tried this product we'd love to hear what you think so please leave a review. TERRANOVA Magnifood Intense Greens is a nourishing, intensely synergistic blend of Rice Bran Actives, Cereal Grasses,Microalgae, Fresh Freeze Dried Greens, Probiotics and Digestive Enzymes - plus the equivalent of a 28ml wheatgrass in every serving.